We could all use more times when fate brings together two of our favorite things. 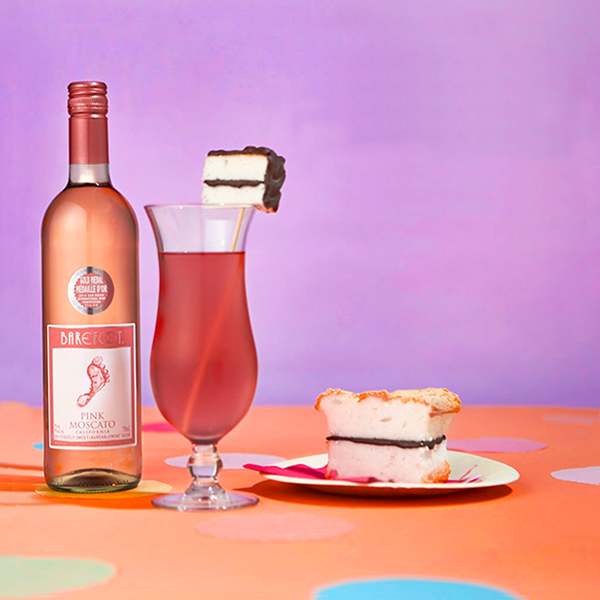 Thank goodness our Cake Break Cocktail pairs our Pink Moscato wine with cake. Cut angel food cake into small squares no larger than 1 inch. Place 3 to 4 cubes on a skewer. Roll skewered cake cubes in chocolate powder and set aside. Place liquid ingredients in a cocktail shaker with ice. Shake until chilled. Strain into a chilled cocktail glass. Place prepared cake skewer across the top of the glass. Delicious cocktail, perfect for entertaining & easy to make!